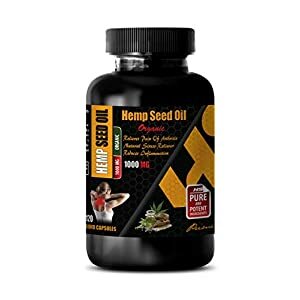 ORGANIC HEMP SEED OIL 1000Mg: Hemp seeds are rich in protein, polyunsaturated fatty acids, omega 6, omega 3 and insoluble fiber. They are a good source of tocopherols or Vitamin E antioxidants. They’re packed with minerals such as potassium, magnesium, iron, zinc, calcium, and phosphorus, plus microelements like strontium, thorium, arsenic, and chromium. ORGANIC WEIGHT LOSS SUPPLEMENTS: Studies have shown that individuals taking GLA supplements for a year gained back less weight. Since hemp oil is rich in GLA, it can be beneficial in this aspect. The omega-3s in hemp seed oil might also contribute to weight loss in some way. CHOLESTEROL LOWERING SUPPLEMENTS: The only vegetable oil to contain omega-3 and omega-6 fatty acids (3:1), hemp oil can help lower cholesterol levels by accelerating metabolic processes. With a faster metabolism, fats burn at a quicker rate and are not deposited on the artery walls. SKIN CARE PILLS FOR WOMEN: Hemp seed oil is often used as a moisturizer for the skin, and for good reason. Studies have indicated that hemp seed oil can dramatically decrease skin dryness to alleviate itching and irritation. Moreover, the antioxidant and anti-inflammatory properties may protect against the aging process while soothing the skin. 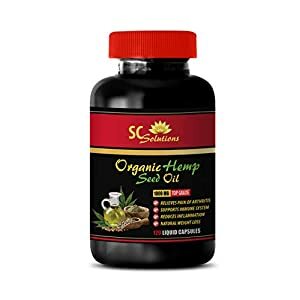 BRAIN HEALTH FORMULA: Hemp seed oil contains essential fatty acids, including docosahexaenoic acid (DHA), that are required for brain development. DHA is crucial to the health of the brain as well as the retina of the eye, particularly in the first year of life. HEART HEALTH OMEGA 3: The seeds contain high amounts of the amino acid arginine, which produces nitric oxide in the body. Nitric oxide is a gas molecule that makes your blood vessels dilate and relax, leading to lowered blood pressure and a reduced risk of heart issues.